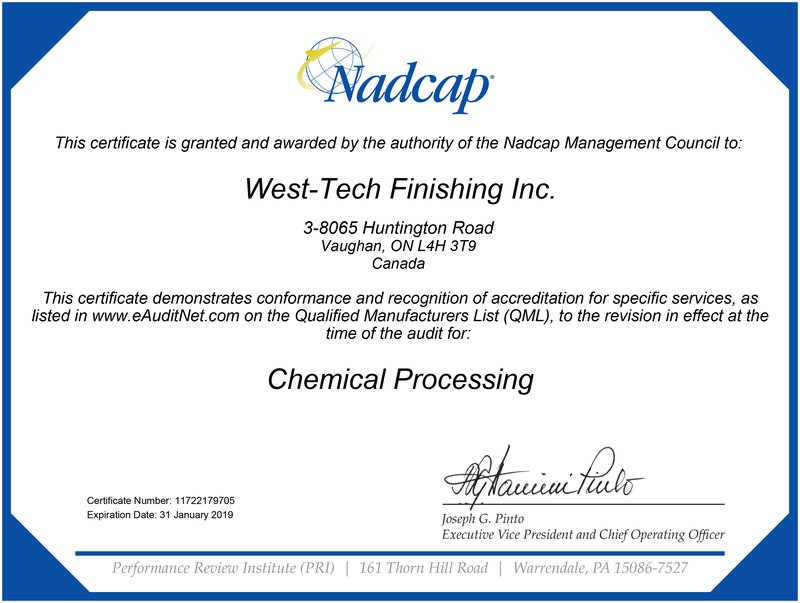 West-Tech Finishing’s quality management system is NADCAP accredited. Having NADCAP certification places our facility among the top finishing suppliers in the industry. Customer Service Manager Glen Attridge explains why this matters to our customers. What is NADCAP and what should it mean to your customers? NADCAP is an intense certification process by third party auditors to ensure that our quality management system is effective. Having an effective quality system reduces scrap and rework resulting in more competitive pricing to our customers. What are the steps to achieving a NADCAP accredited quality system? NADCAP is the granddaddy of all quality management systems . To achieve NADCAP accreditation your quality management system has to be certified to ISO9001:2008. ISO is quite common for most finishers. The next step is to upgrade your system and receive AS9100C certification. AS9100C covers all the ISO requirements but is more stringent than ISO. After your quality management system is certified to ISO and AS9100C you can proceed to NADCAP certification. With our quality management system in compliance it ensures a quality product for our customers. What is NADCAP’s significance in the aerospace industry? In order to work in the aerospace industry many companies require NADCAP certification. What is West-Tech’s advantage in the industry? We feel that our main advantage is our team of operators and technicians. They take great pride in their work. Our second advantage is our automation. Many of our competitors rely on the human aspect for producing products while our lines are fully automated. Our system ensures the parts flow through the process without any bottlenecks or delays. It ensures great quality and repeatability. Why is it important to stay up to date with certifications and technology? We strive to be the best. In order to be the best you have to ensure that you can meet the toughest industry standards.